What do we do about our hands aging? They say you can tell a woman’s age by her hands. Well I know that I look years younger than my age but my hands look about twenty years older than me. I was most put out when a man actually said to me that my hands were very old. I did not like that at all and I wonder if I still like him! Well what can we do? There are lots of creams that claim to get rid of those brown age spots but I’m not sure that they work well not for me! If any of you know one that does please let me know. Laser and Fillers do work but I have heard they are very painful on the skin and your wallet. The skin on my hands is very thin and I think it would be agonising to have this done and I am not sure how long it would last as we use our hands much more than we do our faces. Cosmetic Surgeons are now injecting fat into hands. Almond Oil is very good. 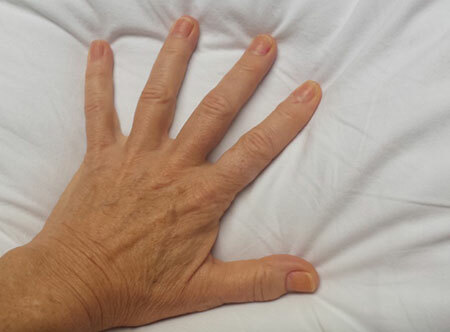 Hand models often apply it at bedtime and then wear cotton gloves to sleep in. Your anti aging moisturizer can help if you apply it to your hands especially at night. Using a cream that has Sun Protection in it is good for your hands as they are exposed all of the time. Carita has a hand cream that was voted top of the tree for years. Cocoa butter is said to be very good but clinical studies disagree.